Press CTRL + D to add the file called frmOldestPerson.vb from the above folder into your project (or right click on the project and choose to add it as an existing item). 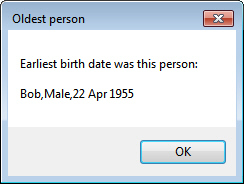 Clicking on the button should display the name of the person whose date of birth is earliest. See below for how to achieve this! You should find that Bob has the earliest date of birth. You can use Split (using a comma as a separator) for each array item to retrieve each person's date of birth. You're now an array guru!